An amazing Raspberry Melomel (mead with fruit) complete with a whopping 15lbs of Wildflower honey and 6lbs of delicious Raspberry pureee. Your amazing elixir will feature a slightly sweet honey flavor with a golden red color and very evident all natural raspberry flavor and aroma. The honey we choose for our meads is top of the line USA wildflower honey from a long time apiary supplier in California. We are very picky about our honey and we guarantee you can taste the quality. This is a very special beverage that you can lay down and enjoy over multiple years. Perfect at the holidays, around a camp fire, or as a night cap. 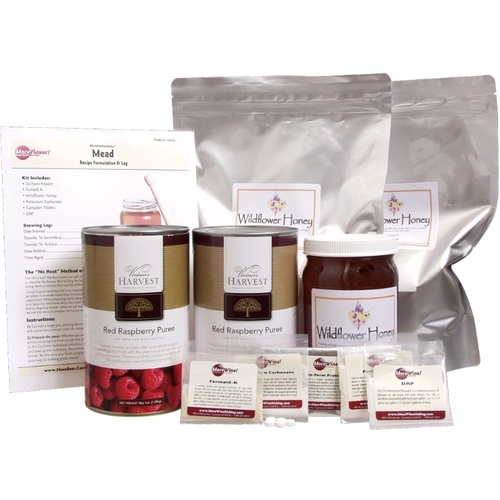 In addition to honey and fruit puree our meads kits include three types of yeast nutrient (which are absolutely essential) along with potassium carbonate to raise pH, pectic enzyme to break down the raspberry puree, and campden tablets.